NextGEN Gallery is the most popular (most downloaded) WordPress plugin as of this writing. It’s continually suggested that the plugin become integrated into the core WordPress framework to provide WordPress out of the box gallery functionality because the majority of WordPress users install the NextGEN Gallery plugin anyways. For purposes of this tutorial we’ll assume you’ve already installed the NextGen Gallery plugin in WordPress. After installing the plugin, you’ll find the NextGEN Gallery configuration area near the bottom of your admin area on the left side pane. The admin menu title will be “Gallery”. Mouse over the Gallery menu header and click on the arrow symbol that appears to right of the Gallery title. This will expand the Gallery menu to reveal the NextGEN Gallery options and settings. Your first task will be to create a new Gallery where you’ll be able to upload photos and image into from your computer. Click on the “Add Gallery / Images” link in the Gallery menu. Next click on the “Add new gallery” tab. This will bring up a new page that prompts you to enter a new gallery name. Type your new gallery name in and then click on the “Add gallery” button. 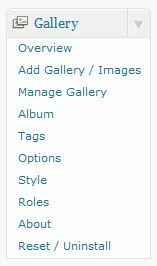 This will add your new gallery to WordPress as an empty gallery ready for you to upload images to. To add an image, gallery, or album from NextGen to a WordPress page or post, open the page editor for a particular page and click on the NextGen icon in the editor tool bar. It’s normally located on the top line of the editor toward the right hand side and looks like two small rectangular images overlapping each other. Once you’ve added the gallery, album, or image to the page, a short embed code will now appear on your page. Preview the page and if you like how the images are showing up, you’re good to go. If not, you can simply highlight and delete the embed code and start over by clicking on the NextGen icon and reinserting the images using different settings.